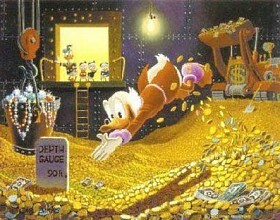 Scrooge McDuck takes a swim in his literally liquid assets. "Aaahhh! It's not a liquid! It's a great many pieces of solid matter, that form a hard floor-like surface! Aaahhh!" The greedy character finally has his desired fortune piled under his feet, he couldn't be any more glad. So how does he enjoy this moment? He dives into the pile and gleefully swims around like it was the best swimming pool ever, or rest on it like you would while floating peacefully. As the page quote demonstrates , pooling together large quantities of small, solid material won't magically give it the properties of a liquid. In fact, diving into a pool of gold coins won't be much different from diving into a giant solid block of gold. But you can't let a little thing like physics get in the way of demonstrating a perfect example of just how wealthy a character can be. The effect can also be achieved (much more realistically) with dollars/bills, which are softer and, when pooled together, much more malleable (though you may run the risk of a few papercuts). It doesn't have to be actual currency; it could be jewels, treasures, some valuable fluid or pretty much anything the character wants. Subtrope of Conspicuous Consumption. May overlap with Money Fetish and Sand Is Water. Often a part of an If I Were a Rich Man fantasy. Not to be confused with Liquid Assets, or with the standard usage of "pooling" funds, that is, raising them among a group of people to be distributed in case of some emergency, or as a prize. See also Dragon Hoard. In Medaka Box, the goal of the swim team is to garner enough money to fill a swimming pool and then swim around in it. One of the Q&A sections in the Vol. 0 Mahou Sensei Negima! that was distributed in the Anime Final movie showing revealed that Haruna became rich in the Magic World by successfully introducing the Boys' Love Genre to its citizens. She's then shown wearing a swimsuit and gleefully swimming in the money she gained. Halekulani from Bobobo-bo Bo-bobo is first seen bathing in a huge tub of money. In the Lupin III (Pink Jacket) episode 'Farewell, Cinderella', the King and Juliet swim around a pool filled with money. Bonus points for Juliet for jumping from a high platform and being able to do some backstroke swimming. In the Lupin III (Red Jacket) episode, "Charity Begins At Home", the target keeps his gold under his bed, in a vault shaped like a small swimming pool, just so he can play this trope. The classic Astro Boy story "Invasion of the Robot Bombs" featured a crime boss who did this. Eventually so much gold got absorbed into his skin that he came down with heavy metal poisoning and died. In the Hellboy story "Box Full of Evil", one of the people opening the titular box demands from the demon within "Enough gold that if I were to lie down I would find a crown upon my head". He gets it Sort of. The demon tells him that the treasure he seeks is already hidden within a wall of the castle, then possesses his sister and turns him into a monkey, at the end of the story, he's killed by being thrown though a wall, right on top of large pile of money, with a crown falling at his head. Larfleeze, leader of the Orange Lantern Corps, swims in a pile of collected orange power rings. Scrooge McDuck of the Disney Ducks Comic Universe does this all the time. This originated in the comics, but is probably more widely known because of his animated incarnation in DuckTales (1987). This is such a well-known trait of the character that it's played around with a fair bit. At times in the comics, there are even things that happen (or don't happen) to Scrooge because swimming in coins made his pores covered in metal. "I dive around in it like a porpoise! And I burrow through it like a gopher! And I toss it up and let it hit me on the head!" Lampshaded in that Donald Duck and his nephews will occasionally try it, and break their heads on the metal (the first time they saw him do it, they feared for his sanity/health). Scrooge even managed to trick the Beagle Boys into trying this in Only A Poor Old Man. Also, it only works with money, even for Scrooge. While diving around in his cash-filled train wagons in the second-to-last album of The Life and Times of Scrooge McDuck, he comes to an abrupt halt on a pile of coals. In one story, they actually turn the vault into a tourist attraction, with people taking rowboats onto the gold. Subverted in The Last Lord of Eldorado. After having found a pile of coins on a treasure cruise, Scrooge tries to dive into it. Instead he cracks his head because the coins were fused together after spending hundreds of years on the bottom of the sea. Expect Richie Rich's Aunt Noovo or some rich relative of his to be swimming in a pool of money. Referenced in All-New Wolverine. Multiple characters with healing factors are gathered to cure a plague, with Deadpool specifically mentioning that he wants enough money to fill a pool. Gabby tries to point out that this won't actually work. At the end of a Simpsons comic story which had been one huge parody of DuckTales (1987), Burns attempts this with a room filled with all the treasure he'd collected in the story. He ends up in a full body cast afterwards. Toby attempts to do this in Harry by Proxy . Unfortunately, he severely injures himself upon contact with the gold. Toby: Scrooge McDuck lied to me. It's not a liquid. It's a great many pieces of solid matter that form a hard floor-like surface. In Harry Potter and the Dream Come True Remus claimed that Sirius had a diving board fixed to the wall of the Potter vault in Bangladesh, which they and Harry's father could "literally" swim in. Subverted in Saw II with the dirty needle trap. Despite summaries suggesting that Amanda was wading through a pool of used hypodermic needles, it's more like a level ground surface that she's just sifting through. According to the Studio 54 movie, Steve Rubell would take his nightclub's receipts home in cash, dump it on his bed, and roll around it. Then he'd likely throw up. In Oz: The Great and Powerful, Oscar jumps into and rolls around in a huge pile of gold coins in the royal treasury at the Emerald City. In silent short film The Mystery of the Leaping Fish, the bad guy literally sleeps on a pile of money. Smaug in The Hobbit: The Desolation of Smaug slithers through his immense hoard as if it were lightly-packed sand. This may be more justified than most examples given his tremendous size, and corresponding weight and strength, compared to Bilbo, who generally has little issue standing and climbing on it. In the SF novel Rocheworld, a multimillionaire discovers she's been selected for a one-way interstellar expedition. Since she'll never need money again, she instructs her broker to liquidate everything into cash. She also contacts the owner of a staggeringly rare gold coin, and arranges to purchase it for a number equal to her approximate net worth. He shows up at a warehouse with the coin in a protective briefcase, expecting a check or similar. She emerges from the warehouse adjusting her clothes, and says, "Don't try to swim in the bills. Paper cuts." She then puts the coin in her pocket, walks away, and takes it with her when she leaves the Solar System. In The Voyage of the Dawn Treader, a book in C. S. Lewis's The Chronicles of Narnia series, Eustace sleeps on the money of a dragon's hoard, and this winds up turning him into a dragon. In the Magic: The Gathering novel Scourge, Kuberr and anyone near him can swim through a pile of coins because of his control over gold. In Robert E. Howard's Conan the Barbarian story "Queen of the Black Coast", Belit does this. With a cry Belît dropped to her knees among the bloodstained rubble on the brink and thrust her white arms shoulder-deep into that pool of splendor. The Clark Ashton Smith story "The Weird of Avoosl Wuthoqquan" has this, although the titular greedy merchant discovers all too late that a huge pit of jewels is less like water and more like quicksand. In the Gotrek & Felix novel Dragonslayer, one of the Dwarf Slayers succumbs to Gold Fever in the middle of the fight with the Dragon and dives into its hoard. He's later crushed under the Dragon, with several coins embedded into his corpse by the weight. A Dutch lottery show once had a game where people were standing knee deep in a big tank of coins and had one minute to grab as much coins as they could and stuff it into their pockets (in overalls covered with pockets). And yes, they could keep it too. Similarly, in the UK in The '90s, Noel's House Party featured "Grab A Grand" in which the contestant was placed in a wind chamber full of banknotes with the goal of collecting £1000 in a minute. Alluded to in How I Met Your Mother when Marshall jokes with his loan officer about getting the loan in singles so he can fill up a swimming pool and dive through it. When two Mooks are sent to pick up a huge pile of cash in Breaking Bad, one of them refuses to do any heavy lifting until he's had the chance to lie down on it for a few minutes. On Family Ties, Alex lands a job with a financial firm by telling the interviewer he loves money so much that he's rolled around naked in it. In one episode of Dinosaurs, after Earl wins a lawsuit, he has enough money to fill a swimming pool. In one segment of an episode of 1000 Ways to Die, was about a woman who spent her days frolicking in the cash she embezzled from her rich husband. One day an earthquake strikes and multiple bags of money fall on top of her, suffocating her. In one episode of Sabrina the Teenage Witch, Salem the cat has money brought to him in singles for the express purpose of rolling around on it. Salem: I'm rich! Rich, I tell you! Hilda: Salem, it's only a few hundred dollars. Salem: I'm well-off! Well-off, I tell you! Done frequently in the animations for Monopoly. Reality Ensues for the Storyteller in the final episode of Season 4 of John Finnemore's Souvenir Programme. Storyteller: It took place in the spring of 1908, a year which found me even more than usually rich. As a result I took time off from diving into my swimming pool full of gold florins to recover from the various head injuries thus sustained. The Western Paladin in the Magic: The Gathering card Greed does this. This is considered standard behavior for dragons in Dungeons & Dragons. One book devoted to them, the Draconomicon, points out how improbable this is considering the volume of the coins and the size of most dragons (even taking into consideration that they are typically 3x as rich as monsters of the same power level). The book even mentions that some dragons will convert their treasure into smaller denominations just to make wallowing in their wealth more practical. In Super Castlevania IV's Block 9, you go through the treasury, which at several points have piles of gold. You can sink into the gold, and completely submerging yourself in it has the same effect as submerging yourself in water. If you watch the Orkz' Pile O' Gunz in Dawn of War long enough, a gretchin will take a dip in it this way. Mog speaks of doing this once the party resolves the paradox in the Bresha Ruins in Final Fantasy XIII-2 but the prize turns out to be a coupon good for free toilet paper. In the Updated Re-release of the Ducktales game, you can swim around in Scrooge's money vault. One of the playable characters in Yakuza 4, Akiyama, runs a loan business. One family takes advantage of his loan in order to fill a hot tub with bills and lounge in it naked. If there were an onomatopoeia for an unwise tourist slamming face-first into a giant pile of gold, that'd be it. You obtain nothing more than a headache and regrets. Smite: Fafnir, a very greedy dwarven prince that turns into a dragon, is amongst the roster. If he wins the match, his victory animation involves taking a dip in his Dragon Hoard, swimming there and turning into a dragon in the middle of the swim to enjoy his hoard. Deacon: You ever wanna fill a bathtub with caps? Subverted in this Penny Arcade strip with trading pins instead of money. Jason does this in an Imagine Spot. One Consolers strip in the "Rise and Fall of Atari" story shows Atari bathing in money. In Chivalry and Knavery , after defeating a dragon Kira fills a bathtub with her share of its hoard. In Girl Genius Baron Oublenmach imagines he'll be able to do this after getting a reward for ringing the Doom Bell. In reality Franz just showers him with an, admittedly gigantic, handful of gold coins after disappointingly learning Oublenmach had technically aided the Heterodynes so he couldn't just eat him. What If? suggests doing this after you magically acquire all the money in the world . There are no problems with the science here. Every part of this is possible. The same entry also lists another problem with trying to do this in real life other than the one Family Guy pointed out: that much cash would violate building codesnote At least New York's by exceeding the maximum pressure on the side of the building. Noob: La Quête Légendaire shows Gaea lying in a room full of gold coins in an early scene. Homestar is shown bathing in a tub of gold coins while singing the DuckTales (1987) theme in an easter egg for the toon "Ever and More"
CollegeHumor: Deconstructed in this parody video , where Scrooge McDuck from DuckTales (1987) accidentally breaks all of his bones after jumping into his pool of money, resulting in him being immediately rushed to the hospital where he then dies. A funeral is held for him, where he is buried with all of his money, and as a result his grandnephews Huey, Dewey, and Louie go crazy over their granduncle's death and end up in prison, their uncle (and Scrooge's nephew) Donald Duck becoming very angry with them and refuses to pay their "duck bail", before finally going bankrupt and committing suicide. Stabilize his neck, Oh, no! His heart failed! Scrooge McDuck of DuckTales (1987) does this as his main pastime. See the comics section for more information. DuckTales (2017) continues this trend and even shows Scrooge exploiting it in the first episode using it to sneak behind Glomgold in the Atlantean treasure chamber. The trope is actually deconstructed and justified when Louie sees the money bin for the first time and tries to do it. Scrooge grabs him and tells him that the only reason Scrooge can do it is that he spent years practicing and mastering the skill. Louie, on the other hand, would probably crack his skull open. Louie does eventually get the hang of it, as he's seen swimming through the coins to get away from Magica. Scrooge has the most delighted look of surprise when he finds out Louie learned. Gladstone Gander, at one point, fills a hot tub with casino chips and does a mocking Scrooge impression. Even in the original animated series, one time the nephews attempted it and failed miserably, prompting them to all look at each other and go, "How does he do that?" On SpongeBob SquarePants, Squidward does this on a pile of Krabby Patties after he becomes addicted to them. Mr. Krabs does this with money, and in one episode, a vault full of diamonds. On South Park, Cartman proves Kyle wrong and wins money in the process, so he turns it into change and makes a swimming pool out of it so Kyle can see him swim in it. Daffy Duck does this with piles of gold coins in the Looney Tunes short Ali Baba Bunny starting at 2:15 . Subverted on The Simpsons when Homer is told he could become a "moderately wealthy man" and has a daydream of rolling around in not quite enough cash. Daydream Homer commented that, as a "moderately wealthy man", he could rent anything he wanted. And the simulation of Thomas Edison's heirs, after the discovery of his six-legged chair. Deconstructed in Family Guy. Peter jumps into one of these after hitting the lottery and winds up bloody with bones sticking out. As noted in the page quote, it turns out that gold is quite dense, so even though it's malleable, you don't want to jump into a pile of it. In the Title Sequence of The Raccoons, Cyril Sneer is seen lounging in his vault with piles of gold similar to Scrooge McDuck's. In The Smurfs: The Legend of Smurfy Hollow, Gutsy lies down on top of a big patch of smurfberries that he found Brainy picking his smurfberries from after he scared Brainy away, looking like he's doing the backstroke. In Clarence, the titular character does this in a Dream Sequence in an episode called "Clarence's Millions", complete with music that parodies the DuckTales theme song. The very first episode of Mysticons has Piper try taking a plunge into the heaps of coins of the Royal Treasury. "Try" being the operative word; Reality Ensues and she smacks face-first into the unyielding metal. Piper: Yeah, that seemed like it was gonna be way more fun. Teen Titans Go! has Robin, Cyborg, and Beast Boy fantasize about swimming in their newly-acquired money in one episode. Complete with a DuckTales theme song parody. In a later episode, they swim in a pile of pennies and react to it like a far more cartoonish version of the Family Guy example above. A waiter at the London Hilton discovered hugely-talented-but-wasted N.I. footballer George Best one morning, on a bed covered with both cash (won at gambling) and the newly-crowned Miss World (1974 Miss USA Marjorie Wallace). The waiter asked: "George, where did it all go wrong?" Hank Williams, a country music singer, after finally getting out of the poverty that plagued him for much of his life, did this when his first hit record sold a million dollars. If you wanted to do this with dollar bills (bills are probably the way to go to not be injured, save maybe paper cuts), you'd need about 335,000 if you wanted to a fill a standard-sized bathtub, according to this. Even if you only filled it halfway in order to swim a little, you'd still need about $167,500 to fill it halfway if you used U.S. one dollar bills.